Raul Mondesi strikes out in his major league debut in Game 3 of the World Series. NEW YORK — The Royals’ Raul Mondesi became the first player to make his major league debut in the World Series. 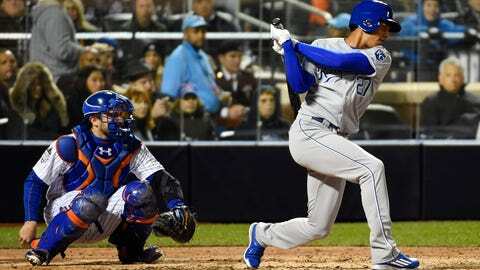 The 20-year-old, added to Kansas City’s roster on Tuesday, pinch hit in the fifth inning Friday night with the Royals trailing the New York Mets 5-3. He struck out on four pitches. Mondesi hit .243 with six homers and 33 RBIs this year at Double A Northwest Arkansas. His father, Raul Mondesi, was the 1994 NL Rookie of the Year with the Los Angeles Dodgers and an All-Star the following season. He played 13 seasons in the big leagues and reached the postseason three times but never appeared on a World Series roster.